Nine Year 12 students sat the Cambridge Chemistry Challenge examination for Lower Sixth students on Tuesday 26th June. The students answered questions about mining the moon with a view to any future colonists being able to manufacture oxygen to breathe in situ, and about monitoring the water quality in swimming pools. are very good results, and Laura’s in particular is a brilliant and exciting achievement, showing notable acuity. 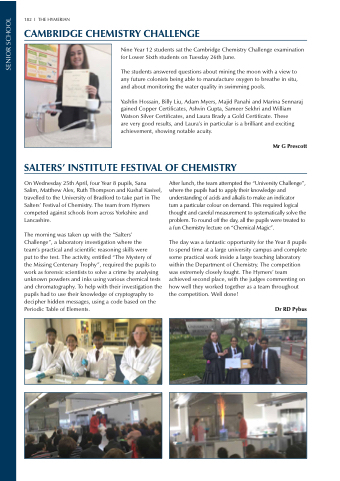 On Wednesday 25th April, four Year 8 pupils, Sana Salim, Matthew Alex, Ruth Thompson and Kushal Kasivel, travelled to the University of Bradford to take part in The Salters’ Festival of Chemistry. The team from Hymers competed against schools from across Yorkshire and Lancashire. the Missing Centenary Trophy”, required the pupils to work as forensic scientists to solve a crime by analysing unknown powders and inks using various chemical tests and chromatography. To help with their investigation the pupils had to use their knowledge of cryptography to decipher hidden messages, using a code based on the Periodic Table of Elements. turn a particular colour on demand. This required logical thought and careful measurement to systematically solve the problem. To round off the day, all the pupils were treated to a fun Chemistry lecture on “Chemical Magic”. The day was a fantastic opportunity for the Year 8 pupils to spend time at a large university campus and complete some practical work inside a large teaching laboratory within the Department of Chemistry. The competition was extremely closely fought. The Hymers’ team achieved second place, with the judges commenting on how well they worked together as a team throughout the competition. Well done!